Living with the effects of getting older is a challenge for all of us – and for people who’ve been affected by Thalidomide it can be hard, as joints deteriorate and it’s easier to get tired. It can be easy to think ‘oh, that’s it for me now’ – but it’s not. Making positive changes to your life, getting active and social can really make a difference, emotionally as well as physically. 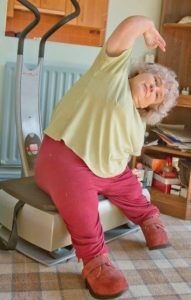 With short arms and legs, and a bad back as well, Kath was at a loss as to how to improve her fitness. She can walk short distances but has to use a wheelchair outside the home as mobility can be difficult. To help her back Kath attended NHS physio but found that six sessions wasn’t enough to really sort her back out – just as she was getting better the sessions had to stop. She resorted to going to a private physio, which she pays for out of her Health Grant, and has been going every week for the last nine or ten years. “I tried all sorts of exercise to stop the pain”, says Kath. “Swimming made my back worse as I have a curvature and the only solution was to swim on my back. That can be quite tricky in crowded pools and also, as I’m four feet tall, even the shallow end of a conventional pool can be too deep for me. That ruled out Aqua Aerobics as well. “I was getting heavier and heavier so I decided, reluctantly, to go on a diet. It was then that The Trust held its first ‘Fit for the Future’ event and I went along, not sure what I’d get out of it. “It can be hard to make changes – the fear of failure can put you off but it’s easier if you set small goals. I did it half a stone at a time and before I knew it I’d lost two stone. A lot of us thalidomiders say ‘ooh, my joints are going’ and I kind of thought ‘oh, that’s my lot, then’ – but it really doesn’t have to be. Yes, our joints are going –but we can still do things to slow it down. “Having been ‘a mum’ for a long time I decided that it really was time to do something for me. I was quite grumpy when I was in pain, and couldn’t go out as much with my two sons and husband. Sometimes I had to stay at home whilst they went for a meal. Now I go to the cinema with them, for nice meals (the 5:2 lets you do that!) and we even go shopping in town.